Boomerang Village Cottages is situated on Kata hill side, with panoramic views of Kata Beach and is approximately 80 meters above sea level. 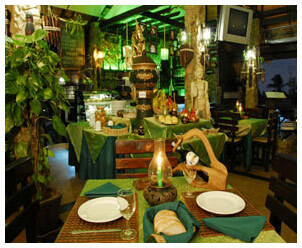 The village is dipped in the nature of a tropical garden and is approximately 6000 Sq.m. in area. 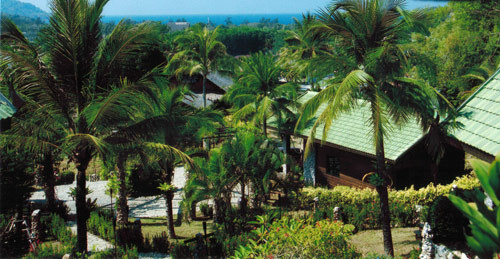 The beach is about 750 meters away (5-10 minutes) and Kata center is just 300 meters away. We are just a 45 minute drive from Phuket International airport. The rooms have a private terrace, with panoramic views of Kata Beach and tropical gardens, and are tastefully decorated in Thai style. All rooms have a King size bed or extra 3-4 bed ( bunk bed ). Facilities include air conditioning with individual controls and fan, satellite TV, private bathroom with shower hot and cold water and full set of toiletries, refrigerator, miniBar, safety box, hair dryer , beach-towel , room service. All rooms are non-smoking. Suites have a private terrace, with panoramic views of Kata beach and tropical gardens, and are tastefully decorated in Thai style. All rooms have a King size bed or extra 3-4 bed ( bunk bed ). Facilities include air conditioning with individual controls and fan, satellite TV, private bathroom with shower hot and cold water and full set of toiletries, refrigerator, miniBar, safety box, coffe and tea making facilities, hair dryer , DVD-DIVX-VCD player, bath-robe , dressings gown, slippers, beach-towel, room service. All rooms are non-smoking.